Click on the month to see what you might want to be doing on your plot in that month. Prepare your soil – Continue to dig, manure and weed the planting areas if the weather allows in preparation for the new season. 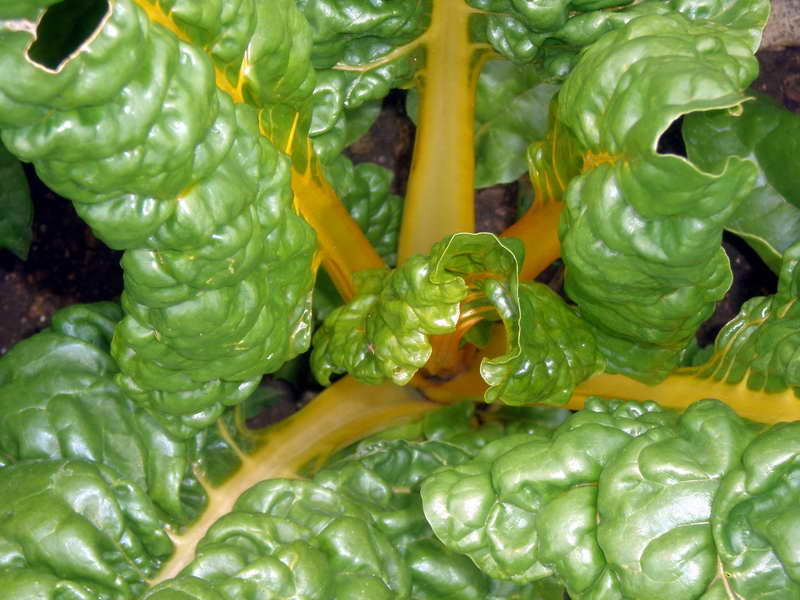 Tidy Brassicas – Remove lower yellowing leaves which can harbour overwintering pests. Sort out your pots – Wash pots to reduce spread of diseases. Warm your soil – If you like to make early sowings of hardy vegetables under protection then encourage good germination by warming up the soil in those areas beforehand. You can do this by covering it with black polythene for a few weeks or by banking up the soil into a gentle south facing slope – even a few degrees will have the effect of moving that area to the south of England! Apples, pears, bush fruit – Prune to remove dead and diseased wood and reshape to have an open center to improve air circulation which reduces diseases. Feed well. Cold season salad leaves – Continue to sow cold season salad leaves under glass. Rhubarb – Force a crown of Rhubarb for an early crop of tender stalks. Place a large pot or upturned dustbin over the crown and surround the ground around it with some insulating material, (eg, compost, straw etc). You can pull the tender young stalks up until the middle of March. For the rest of the year allow it to grow naturally but take only a few mature stems to give it a chance to regain its strength. Cauliflowers – Later in the month start sowing indoors your summer heading varieties of Cauliflowers. Seeds – Plan your plot, check your seeds in date and order any extra seeds you need. Sort out your structures – February is another quiet month, which gives us more time to catch up with those jobs relating to the various structures that we use: for example, repairing old or making new fences, frames, cloches, greenhouses, sheds etc. If you have any old bags of potting compost left over from last season dispose of the contents on your vegetable beds. The John Innes Institute does not recommend storing potting compost long term as the nutrients in them may become unbalanced over time. – If you like to make early sowings of hardy vegetables under protection then encourage good germination by warming up the soil in those areas beforehand. You can do this by covering it with black polythene for 3 – 4 weeks and/or by banking up the soil into a gentle south facing slope – even a few degrees will have the effect of moving that area to the south of England! Potatoes – Chit the earliest seed Potatoes ready for your first planting. Place the tubers in a frost free spot under cover out of direct sunlight. Place then in a seed tray with the “eyes” or buds uppermost. This is to start them into growth prior to planting. Sow some first early Potato tubers in pots under cover (eg., in a greenhouse), for extra early potatoes. Two tubers per pot is enough. Pots need to be at least 12 inches wide and ideally at least 18 inches high. Fill the pot with 6 inches of soil/compost, place the tubers on it and cover with a further 4 inches of soil/compost. Later in the season these pots can be moved out of doors: always keep them frost free however. As the foliage grows fill up the pot with more soil around the stems. This is to keep the new potatoes forming from being exposed to light. Potatoes exposed to light turn green and become poisonous(!). You will be able to harvest your new potatoes when the plants have produced flowers. Top dress any over wintering crops – At the end of the month top dress any over wintering crops (Spring Cabbage, Autumn sown Onions, Garlic), with a Nitrogen rich fertilizer like Chicken pellets to give them a boost ready for the new season. If you use organic fertilizers like Blood, Fish and Bone then apply it to your beds now as a general fertilizer. It takes time to be broken down and incorporated into the soil. It will then be available for the plants when the season starts. – Apply a Potash rich fertilizer to your fruit trees and bushes at the end of the month. Finish any pruning of fruit trees and bushes. Plant Jerusalem Artichokes at the end of the month. They are grown like Potatoes. They make a tall screen of growth in the season so plant them where they will not subsequently shade out other crops that like a lot of sunshine. Its your last chance to get the soil ready for the season so finish your digging. Earlier rough dug ground can be broken down into a smoother seed bed with your Hoe and Rake. If you use organic fertilizers like Blood, fish and bone then apply them now as they take time to be incorporated into the soil. Weeds – If you suffer from annual weeds then try the “stale seed bed” method to help get rid of them. Prepare the ground and leave it until the weeds have germinated and are an inch or so tall: then hoe them off on a sunny day. Keep your Hoe sharp. Perennial weeds must be dug out. Early Sowings – If you want to start some early sowings use the sunniest patch of your allotment. It helps to cover these early crops with cloches or fleece. A soil thermometer is a useful tool. As a general guide, its not worth planting much until the soil is at least 8 degrees C. Possible crops for early sowing include: Radish, Spring Onions, Lettuce, Carrots, Broad Beans and Peas. Make sure the variety you sow or plant is suitable for early sowing. Potatoes – Plant your early potatoes at the end of the month if the weather is suitable. Keep them frost free at all times. Covering them with fleece helps to give them a good start. Dig a trench one spade deep, incorporate some very well-rotted manure and Potato fertilizer (or Vitax Q4) in the bottom, and plant first earlies 12 inches apart along the bottom of the trench. Cover with 4-6 inches of soil. Onions and Shallots – Onion and Shallot sets can be planted this month. Don’t just push them into the soil. Dig a small hole and just cover them with soil. Jerusalem Artichokes – can be planted. Plant them in the same way as potatoes. Parsnips – Germination can be improved by starting seeds off on wet kitchen towel indoors and when germinated place seedling in the ground where it is to grow. Globe Artichokes – can be planted. Brassica plants – begin to harden off any Brassica plants you may have sown in your greenhouse earlier in the year. Either use a cold frame or stand them outside on mild days and bring them in again at night. They need to acclimatise themselves gradually to outside conditions. Do this over 2-3 weeks. Feeding – Remember that there is not a lot of nutrient in potting compost. Generally, assume that there is only one month’s supply. If your seedlings are standing in their pots for longer than that then remember to add liquid feed when you water them. Specialist seed sowing compost has even less. Give any over-wintering crops a feed if you have not already done so. Chicken pellets are very suitable or any other high Nitrogen fertilizer. Leeks – Sow Leeks in pots ready for transplanting out in May. Its “all systems go” now in the vegetable garden. Anything you could have planted in March can now go in but without the bother of cloches and fleece. Potatoes – Plant the rest of your Potatoes: the “second earlies” and “maincrop” varieties. Keep them frost free at all times so be alert for late Spring frosts. Cover any foliage with fleece to protect it. Sow Seeds – It is a busy sowing month. Many of our popular vegetables can be sown now. It is still too early for frost tender vegetables outdoors like Tomatoes, Courgettes, French and Runner Beans. In the second half of the month you can start off some Bean plants in pots under cover ready for planting out in the second half of May. Peas – Early Peas can be sown. To avoid Mice etc eating the seeds after you have planted them you can spray the soil above them with an animal repellent. Old gardeners used to soak them beforehand in paraffin. Soaking peas in water for 24 hours before sowing assists in their germination (Beans also). Young pea shoots are tasty greens for birds so cover them with a net cloche if you can. Weeds – The best time to Hoe your soil between your crops is when it looks like it doesn’t need hoeing. A sharp Hoe will eliminate hundreds of tiny weed seedlings just as they are germinating. Look out for slugs and other pests. Beer traps work well with slugs. I have found them to be very discerning creatures in trials I have undertaken. The better the Beer, the more you catch. Real Ale works much better than value Bitter. The introduction of Horticultural Fleece and Mesh has revolutionised gardening over the last ten years. So many of our crops are afflicted by birds and insects which either eat them or spread disease. So more people today cover their crops with fleece or mesh. Fleece is used during the colder part of the year to keep the plants warm. Don’t use it during the summer. Mesh is a finely spun plastic netting which is laid over the crop. It lets in light and water, provides some shade and shelter, but most importantly keeps out the insects. It is invaluable for covering low growing Brassicas, Lettuces and for surrounding Carrots to keep off the Carrot Fly. Surround your Carrots with a 2 foot high wall of mesh: this will deter the carrot Fly which is a low-flying creature. Mesh and Fleece can be obtained from all mail order organic gardening suppliers. Fleece lasts a year or two: mesh will last for many years if well looked after. Broad beans and peas – Sow successional sowings to maximise your pea and bean crops. Fruit blossom – If there is a frost predicated when your tree is in blossom, protect the blossom with fleece to prevent frost damage to the flowers and resulting loss of fruit. Sow seeds – Continue to sow your favourite vegetables. Read the packet and sow appropriate varieties for the time of year. Little and often is the general rule to avoid gluts. F1 seeds are designed for commercial growers who need uniformity and will all come to harvest at the same time. This is not much use for ordinary gardeners: we don’t want two dozen Cauliflowers coming to head in the same week. Non F1 seeds have more natural variation in them and are more appropriate for domestic gardens. Potatoes – Earth up the soil around your Potato stems as the foliage grows. This is to avoid tubers being exposed to the light which will turn them green and poisonous. Watch out for late Spring frosts. French and Runner Beans – At the end of the month you can sow your French and Runner Beans. Soak the seeds for 24 hours beforehand. (NB, if the seed floats it is dead so get rid of it). Beans love humus rich soil so if you can plant them over a trench of well rotted compost/manure then do so. Keep them well watered. To avoid mice and rats eating the seeds spray the soil above them with an animal repellent. If you sowed some plants in pots last month then plant them out in the second half of the month after hardening them off. 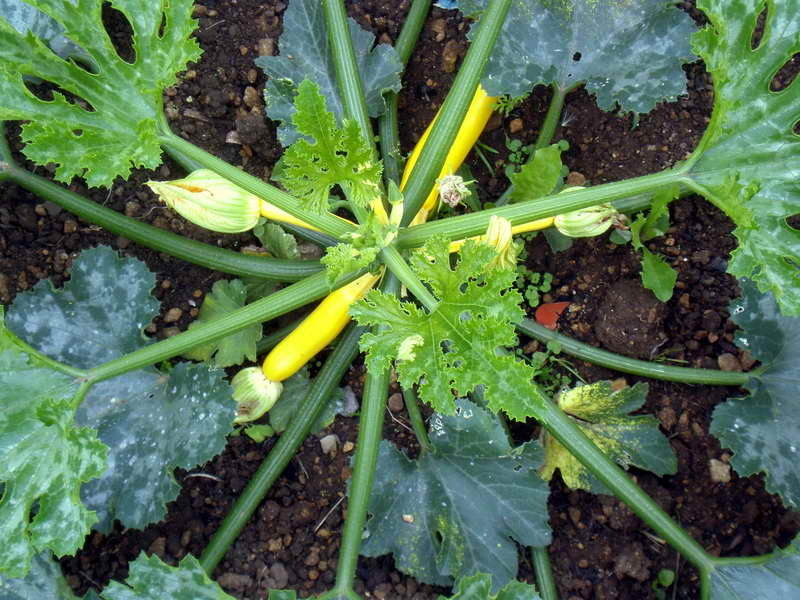 Courgettes, Squashes and Pumpkins – Courgettes, Squashes and Pumpkins can be planted out or sown at the end of the month. They also like humus rich soil. Sweetcorn – Sweet corn can be planted out or sown. It is only worth doing if you can plant out a big block of it. It is wind pollinated and a few in a row have little chance of success. Tomatoes – Plant your Tomatoes into their final stations in your greenhouse for indoor tomatoes. If growing outside chose a suitable variety for outdoor growing and place it in the sunniest and most sheltered part of your allotment at the end of the month after frosts. Watering – Keep on top of watering. Do not let your vegetables suffer any kind of “check” because of drought. It always leads to “bolting” or a loss of quality. Weeds – Watch the weeds which will be growing furiously by now. Do not let them compete with your crops. The weeds will always win! Strawberries – Place a collar or some straw around your Strawberry plants to lift the developing fruit off the ground. Be very careful how you water now. Keep the water away from the fruit and foliage as much as you can to help prevent moulds and rot developing if weather conditions deteriorate. Leeks – Transplant your Leeks into their final positions. Tip them carefully out of their pot, trim off half of the roots and place in a hole made in your soil with the end of a broom handle or dibber. Do not fill the hole with soil. Fill it with water and leave. This is your last chance to sow most vegetables. Use appropriate varieties. As soon as one crop is out of the soil, rake it over, sprinkle some general fertilizer over it, and replant with your late crop. Potatoes – If you sowed some early new potatoes in pots then they should be ready sometime this month. One sign is when the plant has formed flowers. If you planted a row in the ground then you could rummage carefully in the soil around one of the plants at the end of the month to see if it is worth digging up yet. Keep all potatoes well watered and continue to earth up around the stems as they grow taller. 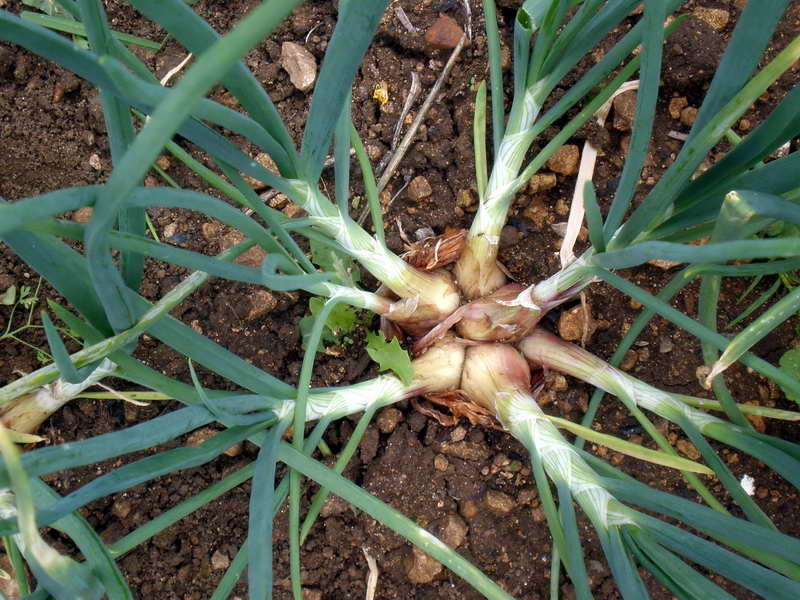 Onions – If you planted over-wintering onions last Autumn then lift and use them now. They do not store well and there is no need to wait for the foliage to turn yellow and fall over. Weeds and pests – Keep on top of weeding and watch out for pests. Strawberries – Net your Strawberries to keep the birds away from the fruit. Be careful how you water them to reduce the risk of rots and mould forming. Beans – Keep your beans well watered. Train them up their supports which you will have put in place when you sowed/planted them. Once they get a hold they will twine naturally up them. Lettuces – Lettuces do not like the direct heat and sun of summer. They are actually a cool season crop. It helps to give them a little shade now. Growing them under horticultural mesh is ideal. Watering – Remember the golden rule of vegetable growing: steady growth without “checks”. Drought is the big risk now. As a general rule, water around the plant and not onto it. Spraying a hose around the garden serves little purpose other than entertaining children and encouraging weeds. Careful watering of the vegetables is better. Harvesting – Start harvesting your crops: baby crops are usually more tender and tastier. Don’t wait until they are big and “woody”. This particularly applies to Beetroot and Broad beans. Apples and Pears – At the very end of the month thin out your Apple and Pear trees. Nature will have made a start with the “June drop”. Remove any small or mis-shapen fruit. Leave one good fruit at each point where they have formed on the tree. Rhubarb – Harvest your Rhubarb until the end of the month and then leave the plant to grow naturally to recover its strength ready for next season. Give it a feed to help it. Cabbages – Plant out seedlings. French and Runner beans – Sow successional beans to extend crop period. Sweetcorn – Plant out seedlings in foot sqaure blocks to enoucrage polliation. Protect from badgers ! Sow seeds – As you use your crops clear the ground ready for your last sowings. You can still sow appropriate varieties of carrot, lettuce, spring cabbage, Kohl rabi, turnips, and oriental leaves. If you want a late crop of Peas sow a first early type as they mature faster. Watering and weeding – Watering and weeding are the big priority this month. Don’t let your crops suffer any checks due to drought or weeds. Potatoes – Clear your first early new potatoes. Use them as they do not store well. Keep second earlies and maincrops well watered and earthed up. If the month is very wet watch out for signs of Blight, (blackened foliage which rapidly dies off). Spraying with Bordeaux mixture is a preventative measure. If you do get blight then remove the foliage and take away: don’t put it on your compost heap. The tubers may be okay – check and if so use immediately as they will not keep. Spring Cabbage – Sow some Spring cabbage plants ready for planting out later in the year for over wintering. Strawberries – Once your Strawberries have finished fruiting remove any straw and cut them down to the ground. Clear up around them and sprinkle a high potash fertilizer around them, (eg, Tomato feed). Water it in well. Healthy new growth will soon develop. Winter Brassicas – Plant out your winter Brassicas. Tomatoes – Remove side b shoots. Apples and pears – Prune and train. Harvesting – Keep harvesting your produce, particularly Courgettes, Peas and Beans. Potatoes – Lift your second early potatoes. Keep maincrops well watered and earthed up. Spring Cabbage – Plant your Spring Cabbage plants. Raspberries – Tie in the new growth of your Summer fruiting Raspberries. Remove last season’s growth once it has finished fruiting. Autumn fruiting varieties are usually self supporting and will be coming into fruit now. Apples and Pears – Cordons and other restricted forms of Apple and Pear growing will need pruning now. Cut back any new growth shoots to three shoots above last year’s wood. Leave the fruiting spurs alone. Standard forms of these trees can be left alone. Watering and weeding – Watering and weeding are the main tasks to keep on top of this month. Brassicas – Support any tall varieties of Brassica with stakes,(eg, Brussel Sprouts) to stop a strong wind blowing them over. Earthing up the stems also helps. Onions – Lift and dry onions. Tomatoes – Continue to feed and remove side shoots of tomatoes. When 5 trusses of flowers are set pinch out the main growing shoot to prevent further growth. Cover tender crops – Cover the tender Summer crops with horticultural fleece now to help maintain a higher temperature around them as the season begins to cool down. This will keep them growing for longer: eg. outdoor Tomatoes, courgettes, salad crops etc. Over wintering onions – If you grow your over-wintering Onions from seed then sow them early this month, ready to plant out next month. If you plant sets then you can leave it until next month. Green manure – As you clear your vegetable beds sow crops of Winter green manure in their place. This will help protect the soil from the Winter weather and improve it when you dig in the crop in the Spring. Seeds are readily available in garden centres. One good winter green manure is Hungarian grazing rye. It is available from Kings seeds. A crop of Broad beans sown thickly as a green manure is another idea. It can also be dug into the soil in the Spring. Blackberries and Raspberries – Cut out the old canes of your Blackberries and Raspberries once they have finished fruiting. Do not cut out this year’s new canes as they will bear next year’s fruit. Autumn fruiting Raspberries can all be cut down to 3 inches from the ground when they have finished fruiting. Spring Cabbage – Plant out your Spring cabbage plants. Cover them with horticultural fleece to help protect them from pests. Winter Salads – Sow your winter saladings in a greenhouse or under frames. Potatoes – Dig up the rest of your maincrop Potatoes to avoid any further slug damage whilst they are in the ground. We are coming to the end of the summer season this month. Potatoes and Carrots – Lift any remaining potatoes and carrots that are still in the ground. Spring Cabbage – Plant Spring Cabbage plants. Protect from birds by covering with horticultural fleece. Overwintering Onions – Plant overwintering Onion sets. Garlic – Plant Garlic cloves. Asparagus – Cut down Asparagus foliage. Brassicas – Earth up the stems of Brussel Sprouts and remove any yellowing leaves from other Brassicas. Clear tender plants – Clear away any frost tender plants that have finished, eg, courgettes, Runner beans. Tidy up – Commence tidying/ digging of the soil. Overwintering salads – Sow over-wintering salad leaves under protection, (Greenhouse or frame), for a supply of salad leaves over the coming months. Strawberries – Create new strawberry beds and plant up with new plants. Berries – Prune Blackberries and other hybrid berries removing only old canes that have fruited. Leave this year’s new canes to fruit next year. Raspberries – Autumn fruiting raspberries can be cut down completely to the ground after fruiting is over. Green Manures – Sow overwintering green manures. Tidying and composting – Press on with clearing away and composting the remains of old crops. Any diseased material should be burnt. Digging over – Continue with your winter digging if the soil is not too wet. If it sticks to your boots when you walk on it then it is too wet. Brassicas – Look after your Brassicas: earth up the stems of Brussels Sprouts; fold over the leaves on Cauliflowers to protect the curds; pick off any yellowing leaves to reduce the risk of disease; cover any over-wintering young “Greens” with fleece or mesh to protect them from bird damage. Raspberries – Plant “Summer fruiting” Raspberry canes. Cut down to the ground the canes of “Autumn fruiting” canes. Soft fruit and fruiot trees – Plant other soft fruits and fruit trees. Winter salads – Sow under glass winter salad leaves. Root vegetables – Lift your remaining root vegetables for storage, apart from parsnips which are better after a frost. Brassicas – Tend to your Brassicas. Earth up tall varieties like Brussels Sprouts to prevent them being blown over in the wind. Pick off any yellowing leaves as these can encourage diseases. Remove promptly any old plants you are finished with to prevent them from harbouring pests over winter. Blackcurrants – Prune Blackcurrants. Remove a third of the oldest wood from each bush at ground level. Winter Salads – Continue to sow and harvest winter salad leaves if you have a Greenhouse to grow them inside. Tidy up – Continue to weed and tidy up your plot if still uncompleted. Manuring or composting – Dig in compost and manure if the weather is suitable for digging. Onion beds – Dig leaf mould into next season’s Onion beds. Check soil pH – Lime your soil if required. The ideal average pH value for a general vegetable bed is 6.5. Test kits may be purchased from Garden Centres etc. NB. Do not lime and manure the same piece of soil in the same season. Plan – Plan next year’s rotation and planting scheme.